Don't overlook Visual Sound in your search for ultimate tone. Creative uses of some high quality tones in every function. Apart from matters of taste, nothing. Given the flexibility of Visual Sound's Route 808 overdrive pedal, what happens when you just can't do without having that crisp Tube Screamer boost as well as a more strident overdrive? 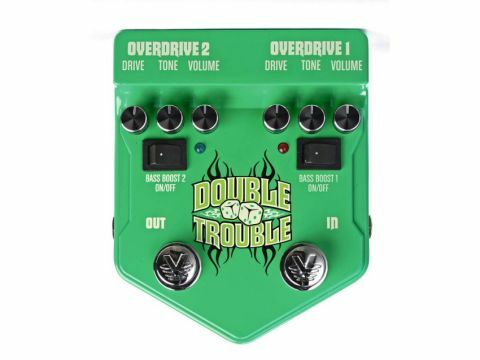 Well, the Double Trouble could be just what you need as it is essentially two Route 808s cleverly fitted into one box. This makes for a huge range of tones, not least because the second overdrive stage behaves differently according to how the first is set up. We set up distinctly different sounds on the two channels, turned them both on, and then reversed the settings… the two resulting sounds were pleasingly different. Our only criticism of this approach is that it takes two stomps to change from one setting to another; we wondered how easy it would be to add an optional 'either/or' mode, where switching one channel on would automatically switch the other off.